Was there a mouse/cell switch? I don’t really hear from almost anyone who fully believes in STAP cells anymore. There’s still a chance that STAP is real, but if I were in Vegas or at the race track I’d put the odds in the single digits at this point. Betting on STAP to be entirely true today would be akin to wagering on a 100-1 shot 3-legged horse in the Kentucky Derby. Of course just about 2 months ago that horse was looking more like legendary horse Secretariat. What I believe is far more likely than STAP being the real deal is that the STAP papers and the data they reported probably at least in part resulted from some relatively avoidable, but potentially devilish problems in the biosciences. The first probable STAP problem is autofluorescence. One of the common themes I’ve heard from people trying to replicate STAP is that the process of stressing out cells and indeed killing them leads to spikes of autofluorescence. Unhappy, dying, and even dead cells can glow when hit with light. That emission can be broad spectrum, but if relatively naive researchers only look in say the green channel they may be misled to believe their cells are in fact specifically glowing green (e.g. have turned on an Oct4-GFP reporter). Another more remote possibility is that the Oct4-GFP reporter turns on when cells are acidified, having nothing to do with pluripotency at all. The second likely STAP problem is a cell mixup/contamination. My first job in science was growing cells in culture at UCSD in 1990. The science stone age, huh? Well, some things don’t change. Back then as is true today, you have to be really careful not to contaminate your cells either with pathogens or with other cells. Especially if you are dealing with a fast growing cell type such as mouse ES cells or iPS cells or cancer cell lines, they’ll in all likelihood happily take over some other culture over time if given the right media. In the STAP case this may have gone to an extreme as at least one researcher involved, Dr. Teru Wakayama, has indicated that he is worried that he was given entirely the wrong cell type. A new article today in Japan suggests that while the STAP paper reported that it used a specific genetic strain of mice/cells called 129 that the cells given by Dr. Obokata to Dr. Wakayama turned out not to be 129 (update: instead it seems to be a mixture of two other strains, most likely B6 and one other, perhaps 129, referenced as “F1” generation in the STAP paper). If correct, this would be an extremely serious blow to the STAP papers. See screenshot from video on that Japanese news site above. A possible third STAP problem is positive reviewer and editor bias. While we as yet have little in the way of a window into the review process of the STAP papers, there have been hints that suggest some of what might have gone wrong. There are indications that the STAP papers in various incarnations were reviewed on multiple occasions and rejected including previously at Nature. Presumably the authors generated more data over time that may have positively influenced reviewers, but I believe a second phenomenon was probably occurring during the sequential reviews: additional, more famous and respected authors were recruited to be part of the overall STAP research team. The reviewers of the resubmitted papers and in all likelihood journal editors too were positively swayed by the presence of the newly added, highly respected authors’ names on the papers. I’ve even heard someone go so far as to say in a broader context “if Dr. ABC is an author on that paper, I believe the paper is true!” Reviewers and editors too should in fact ideally be reviewing the science and not basing their reviews and decisions (positively or negatively) on who the authors are, but in reality the latter makes an enormous difference in today’s review process. Overall, I believe the three problems discussed above may well explain how things seem to have gone so wrong with the STAP cell Nature papers. I agree that the last problem is a big one. For some reason, this site decided to only post the FIRST line of the comment. 😉 So here’s the rest. This really reminds me of the Hitler diaries debacle in the early 1980’s. The only reason anyone ever took them seriously in the first place was because Hugh Trevor-Roper supported their historical accuracy. As everyone soon figured out, he was egregiously wrong. Experts’ credentials do not equal empirical evidence. “A new article today in Japan surgests that while the STAP paper reported that i t used a specific genetic strain of mice/cells called 129 that the cells given by Dr. Obokata to Dr. Wakayama turned out not to be 129 (instead it seems to be a mixture of two other strains, F1 and B6).” is somewhat misleading. Presumably, B6 means ‘C57BL/6 line with cag-gfp transgenes’ and F1 means B6 x129 strain. So, there is no problem. For GFP chimera mouse, STAP/STAP-stem cells must be made from GFP-gene-harboring mice. 129 mice without GFP gene, therefore, must be crossed with GFP-transgenic B6 mice. F1 is indeed presumably from the cross you mention and that cross is also mentioned in the paper. However, I don’t think this situation is anywhere as simple as you say “no problem”. I’ve heard privately that the STAP cells that were just re-analyzed for genetic background that were originally given by Obokata to Dr. Wakayama, were supposed to be just pure 129, but in fact now we know that they weren’t. Thanks, Ken. Great catch. I agree with your conclusion, but a broader point is again the breaking of trust between collaborating researchers. This is a paragraph I will print, frame and hang prominently in my third world university office to remind me not to get depressed when the few papers we think are worthy of an aristocratic Journal get returned without reviewing……Or shall and try get Dr. ABC to be a guest author? “TOKYO—A Japanese scientist raised new doubts about the research methods of the lead author of two disputed stem-cell papers, saying that in one experiment she mischaracterized the type of mouse she had used. Teruhiko Wakayama of Japan’s Yamanashi University, a co-author of the papers, earlier called for their retraction. He said he couldn’t trust data used by the lead author, Haruko Obokata of Japan’s prestigious Riken research institute. The papers were published in the journal Nature in late January. They described a way of turning mouse blood cells into master stem cells by dipping them in a mild acid solution. The approach described in the papers was much simpler than existing methods and could significantly advance stem-cell medicine. But other scientists have so far been unable to reproduce the results, and allegations of image duplications and plagiarism have led Riken and Nature to open investigations. In the latest question to be raised about Dr. Obokata’s methods, Dr. Wakayama on Wednesday described what he called irregularities in an experiment separate from the ones published in Nature. In an email to The Wall Street Journal, he said his laboratory had conducted a preliminary analysis on two strains of stem cells created by Dr. Obokata which he had received and later preserved. He confirmed reports by Japan’s national broadcaster NHK and other Japanese media that the cells came from a different strain of mouse than Dr. Obokata had stated. 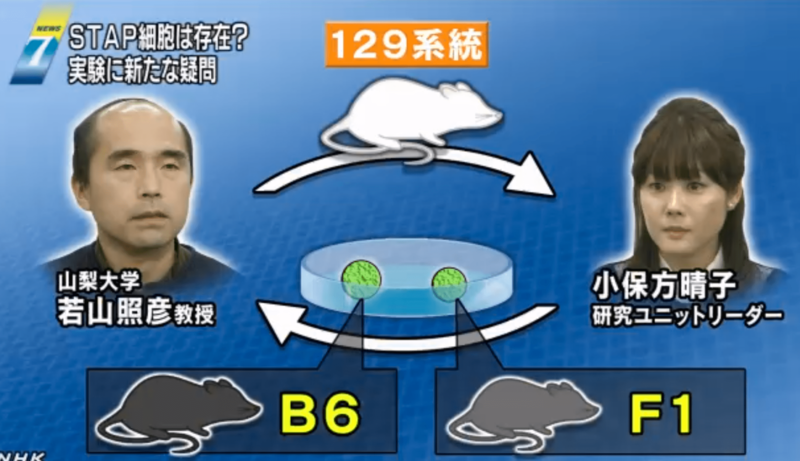 NHK reported that while Dr. Obokata said she was delivering stem cells from mice of the 129 strain, genetic analysis by Dr. Wakayama’s laboratory later showed they were from different strain of mouse cells, called the B6 and F1 strains. Dr. Wakayama said in the email that the reports were “completely true” and characterized the discrepancy as an “inconceivable mistake.” He said, however, that the discovery didn’t disprove the findings in the Nature papers, since the data in question hadn’t been used in the papers. Dr. Wakayama told The Wall Street Journal in an email last week that he has handed over the cells in his possession to a third party for investigation. A Riken spokesman said the institute had received DNA analysis data from Dr. Wakayama’s lab but declined to comment further. Masatoshi Takeichi, the director of the Riken Center for Developmental Biology, where Dr. Obokata works, said in a statement that the center would work with Dr. Wakayama to conduct a detailed examination of the data. i wanted to gather your thoughts on this newspiece. to me, it seems like a serious breach of trust between the grasshopper and sensei. 1). Dr. Wakayama said he received two strains of STAP-stem cells created by Dr. Obokata. But based on the WSJ, the experimental data he obtained with these cells were not used in the Nature papers. Did Dr. Wakayama receive more than two strains of STAP-stem cells from Dr. Obokata? Why is he profiling the cells not used for the two Nature papers? I would investigate the ones used for the papers if I were him. 2). If Dr. Obokata is to generate a pure 129 STAP-stem cell line expressing oct4-GFP, she should make a transgenic mouse directly from the 129 mice, right? Crossing the “C57BL/6 line with cag-gfp transgenes” with the 129 line would leave the F1 with half of the C57BL/6 genes, which is against the purpose of testing the STAP-stem cells generated with a completely different genetic background. In my opinion, acid bath only works on cells that contained acid inducible promoter-Oct4-GFP construct, so the results can not be generalized.